Wedding PR: Country Living, Black Tie Bride, Every Last Detail and more! This week brings oodles of great new press features, including Country Living, Black Tie Bride, Every Last Detail and more! 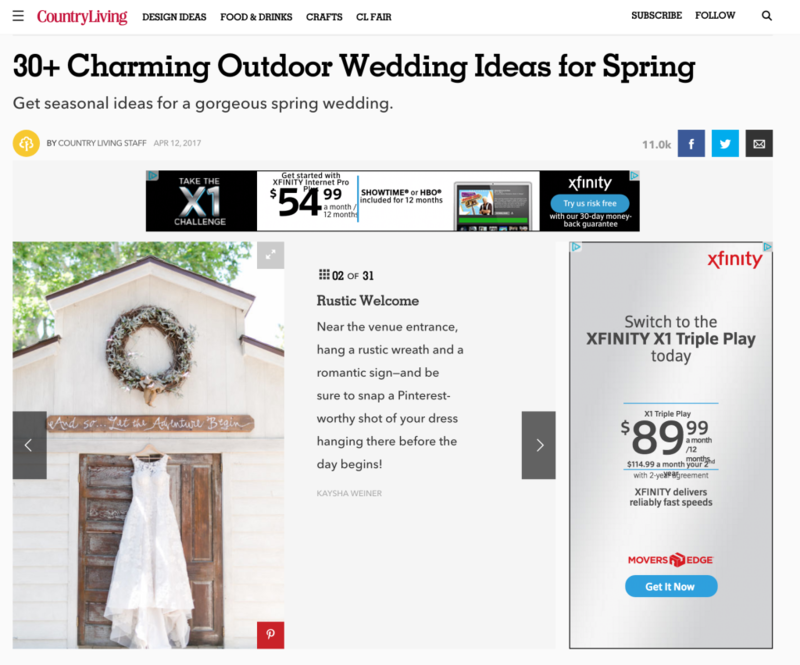 Kaysha Weiner Photographer was featured on Country Living in the roundup, 30+ Charming Outdoor Wedding Ideas for Spring. See the full feature here. Destination Weddings Travel Group and Be Photography was featured on AllSeated with their guest article, How to Save Money on Your Honeymoon. See the full feature here. Be Photography, Mike B Photography, Destination Weddings, 100 Candles, Fantasy Sound Event Services, Wente Vineyards, Stephanie Yonce Photography, and Kaysha Weiner Photographer were featured on The Huffington Post in the article, Easy Ways to Add Even More Personal Touches to Your DIY Wedding. See the full feature here. Don Mears Photography was featured on Tidewater & Tulle with their real wedding, Purple Garden-Inspired Wedding with Popsicles. See the full feature here. Kaysha Weiner Photographer was featured on Elizabeth Anne Designs with her real wedding, Classic Temecula Wedding. See the full feature here. Wente Vineyards was featured on Black Tie Bride with their real wedding, Elegant Wente Vineyard Wedding by Evonne & Darren Photography. See the full feature here. OFD Consulting was featured on Aisle Planner with our guest blog, You Booked Your First Speaking Gig! Now What? See the full feature here. Taylor’d Events Group was featured on Every Last Detail with their real wedding, Green and White Classic Organic Seattle Wedding. See the full feature here. Belladeux Event Design was featured on SWAAY Media in the article, Three Wedding Planners Dish on Opening their Own Businesses. See the full feature here. OFD Consulting was featured on Social Tables with our guest blog, Advertising vs. Marketing vs. Public Relations: Which is Right for Promoting Your Events? See the full feature here.